Ricardo Lopez Sensei, 6º Dan, Hombu Dojo, Japón, began his martial arts training on January 6th, 1965, completing 54 years of uniterrupted practice in January 2019. As a member of the Club Gimnasia y Escrima of Villa del Parque, sensei Lopez began an intensive study of Judo that would last for many years. Around this same time Aikido was in its infancy in Argentina. However, in May of 1967, sensei López along with his Judo instructor and a group of friends, witnessed an Aikido demonstration headed by sensei Miyazawa, who had been in the country since 1964, and sensei Kurata who had just arrived. A number of years later professor López realized the time had come for him to begin his study of Aikido. Apologizing to his instructor and friend Tomás Campelo, Lopez began on his path, that he continues to this day. 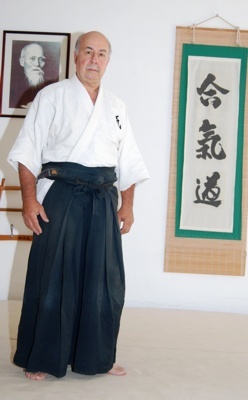 During 1999 profesor Lopez decided to leave the FAA, looking for greater possibilities for his personal, and technical growth, and became the designated representative for Argentina, of the Shimbu-kan of Brazil. This lead to the creation of Shimbu-kan Buenos Aires, actually Shimbu-kan Argentina. Sensei Lopez reugularly participates in seminars in Argentina and abroad. He is now linked with Hombu Dojo (Tokyo - Japan ) through the Shihan Yoshimitsu Yamada, 8th dan, Founder of the Aikido Sansuikai International ( ex Latin American Aikido Federation ), and direct student ( uchi deshi ) of the founder of Aikido O Sensei Ueshiba Morihei.